The isolated dual channel universal signal converter accepts two universal signal inputs and converts them into two signal outputs (analog voltage, analog current or digital signal). A magnetic pick up sensor and encoder inputs are also supported. 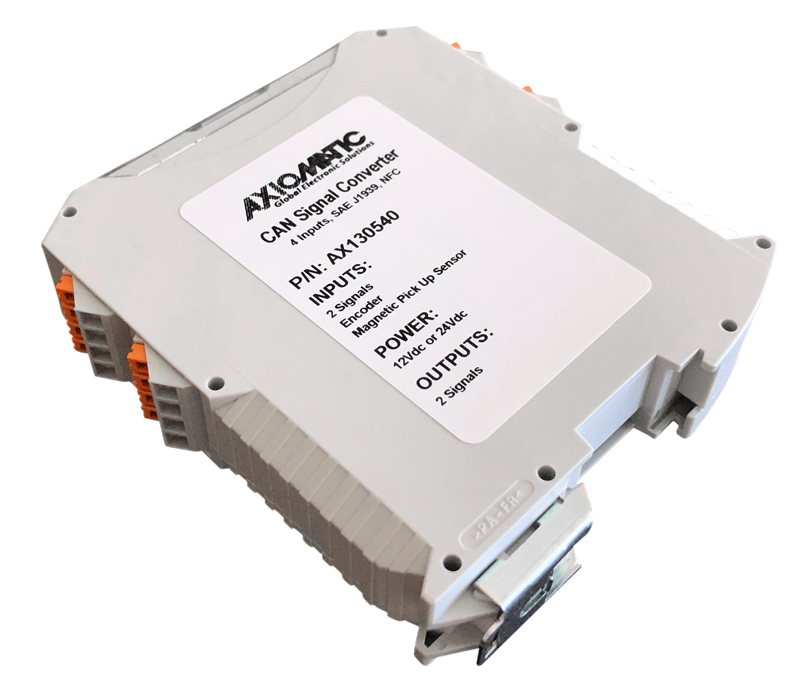 The control can be networked to a SAE J1939 networked engine control system. The unit has 4-way isolation between power, inputs, outputs and CAN. Using the Android application E-Write NFC or the Electronic Assistant® programming tool, the user can configure the inputs and outputs and CAN bus to suit the application. Refer to the table for a list of inputs and outputs. A +5V, 50 mA reference is available to power a sensor input. A rugged power supply interface accepts 12 Vdc or 24 Vdc nominal. LED’s indicate operational status. The enclosure is DIN rail mount. It operates from -40 to 85°C (-40 to 185°F). Inputs:  Two universal signal inputs are selectable as the following voltage or current signals: o 0-5V, 0-10V, 0 to +/- 5V, 0 to +/- 10V; o 4-20mA, 0-20mA, or 0-200 mA; o Resistive; o PWM; o Frequency; o or Digital. Outputs: Two universal signal outputs are configurable as the following signals: o Analog voltage (0-5V, 0-10V, +/-5V, or +/- 10V); o Analog current (4-20 mA, 0-20 mA); o or PWM. Datasheet: Click icon for PDF datasheet.